Visitors of Feyrer Park are in for a treat this summer as new playground equipment and bathrooms have been installed. 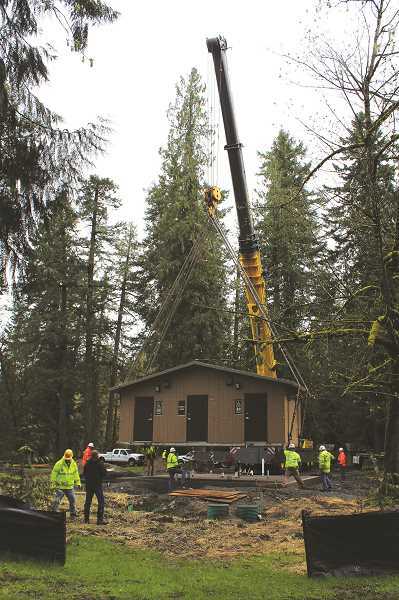 On April 12, the new restroom facility was delivered on three trucks and set in place using a crane from Forslund Crane Service, Inc.
Clackamas County Parks and Recreation began a campaign a couple of years ago, according to Rick Gruen, Clackamas County Parks and forest manager, which involved saving money to prioritize everything involving life, health and safety. They first replaced all of the aging, wooden playground structures in county parks, including Feyrer. Now, they're starting on the restrooms, and Feyrer Park is first up. The new precast concrete bathrooms, textured to look like wood, come from CTX Incorporated in Spokane, Washington, and Gruen expects them to last a lifetime. They replace the previous wood and concrete bathrooms that were built in 1971, which made them among the oldest restrooms in the County Park system. Those were recently demolished. County Parks was able to install the restroom facility thanks to a one-to-one matching Oregon Parks and Recreation County Opportunity Grant. "A project is $100,000, we put up $50, we get $50," said Gruen. The grant for Feyrer Park came to $160,630, which is half the cost of the $321,260 facility. "It's a good leverage of our resources and the state's funding that they bring forward," Gruen said. "It's a pretty good deal." Feyrer Park is located just three miles southeast of Molalla, and it boasts 20 campsites, a day use area, picnic areas, playground equipment and Molalla River access (including seasonal boat access). According to Gruen, campsite reservations start rolling in a year in advance, and by summer time, all weekends are filled. Gruen said the installation of the restrooms is "huge" for the park. Feyrer was first on the list to receive a new restroom facility, but the county will be installing new restrooms at other county parks too, including Barton Park in the Portland area and Metzler Park in Estacada.